The D-Day landings in June 1944 were the turning point in the Second World War as the Allies bamboozled the Nazis with fake invasion plans. But the real heroes were a group of foreign double agents, turned by MI5 to misinform the German army. This true story of people who double-crossed their bosses for reasons of bravery and greed is a compelling tale of our national history. 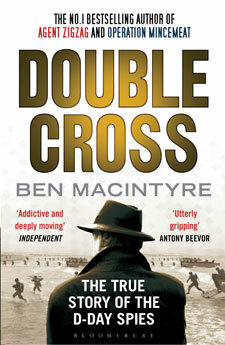 RICHARD SAYS: ‘If you enjoyed Ben Macintyre’s previous bestseller, Operation Mincemeat, then Double Cross is right up your alley. It deals with a bizarre, almost fantastical Allied undercover operation to pull the wool over the Nazis’ eyes. Every piece of information the double agents sent back to Berlin was exactly what the Allies wanted the Nazis to believe. JUDY SAYS: ‘I was both captivated and taken aback by this book – captivated by the eccentricities of the team of foreign double agents so carefully assembled by British spymasters, and taken aback by their courage and determination in the face of a dangerous enemy. Macintyre is clearly fond of them and we take them to our hearts as well. OUR READER SAYS: ‘I don’t normally get enthusiastic about non-fiction, but I couldn’t put this book down. I hadn’t realised the extent that double agents were used in the lead up to D-Day, or how close to disaster the project came. They were a disparate group, some of them unlikely spies, but this just made their story more interesting. Another fascinating true story of WW2 espionage – this time the plot to mislead Germany about the invasion of Sicily. A really pacy thriller about the code breakers of Bletchley Park. When James Zennor goes to America in search of his missing wife, he becomes embroiled in dark wartime secrets.